Chestnuts make a terrific base for any festive soup, and the result here is a silky-smooth, earthy offering, perfectly set off by the crunchy chickpea croutons. 1. Preheat the oven to 220°C (200°C fan), gas mark 7. 2. Heat the olive oil in a saucepan over a medium heat. Add the red onion, carrot and garlic to the pan and sauté for 2–3 minutes until starting to soften. Stir in the chestnuts, chickpeas and miso and cover with the measured water. Bring to a gentle simmer and leave to cook for 20 minutes. 3. Meanwhile, make the chickpea croutons. Add the chickpeas to an ovenproof dish and whisk the orange juice, oil and maple syrup together in a bowl to combine. Pour the orange juice mixture over the chickpeas, sprinkle over the chopped rosemary and generously season with salt. Toss to combine and roast for 25–30 minutes, or until golden. 4. Transfer the soup to a blender and blitz until smooth, then return to the pan and heat through, thinning it out with a little extra water if you like. 5. 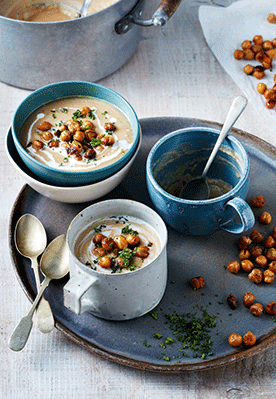 Ladle the soup into warmed bowls or mugs, drizzle over a little soy cream and spoon over the crunchy chickpea croutons. Garnish with a scattering of chopped parsley and serve.